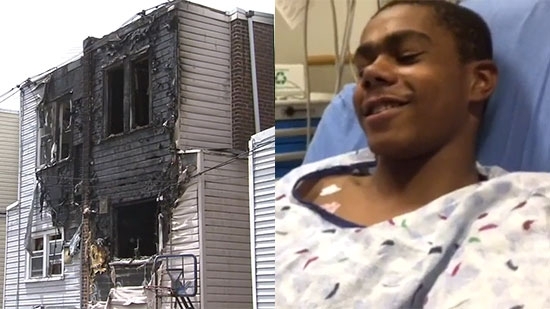 A teenage boy is being called a hero after rescuing his baby nephew from inside a burning home this morning in the Overbrook section of Philadelphia. The fire broke out around 10:30 a.m. on the 1000 block of Flanders Road. There were 8 people inside at the time, 3 adults and 5 children. When they got outside the family realized that the 1-year-old baby boy named Bryce was still inside. 17-year-old Rudy Edwards didn't hesitate and ran back in to the burning home. Once inside he couldn't see through the smoke, but heard his nephew cough and followed the sound to the couch. He grabbed the child and ran outside. Edwards passed out from smoke inhalation and was taken to Children's Hospital of Philadelphia. He will recover. Edwards is in 10th grade at Overbrook High School. Firefighters brought the blaze under control by 10:54 a.m. but the house was completely destoyed. Police are looking for the driver of a minivan wanted for a fatal hit-and-run in Bristol, Bucks County. The driver was traveling southbound on Route 13 near Beaver Dam Road around 11:50 Friday night. 50-year-old Donna Anderson of Bristol Township was crossing the intersection when she was struck and killed. The driver hit her and then turned onto Bath Road, leaving her to die. Police are searching for a dark colored minivan, possibly a 2004-2009 Nissan Quest minivan, with front end damage and a missing headlight. Anyone with information about the minivan or surveillance video from the area should call 215-788-7812 ext. 13 or 911. Former Philadelphia Phillies Hall of Fame pitcher and former U.S. Congressman and Senator from Kentucky, Jim Bunning, passed away at age 85. Bunning won 224 games over his 17-year major league career. He also threw two no-hitters, one in the American League for the Detroit Tigers and a perfect game in the National League for the Phillies on Father's Day Sunday, June 21, 1964, against the New York Mets. He entered politics in his homestate after retiring from baseball. He served in both houses of US Congress for Kentucky.